It’s the birth date of Ford Madox Ford (1873–1939) The Good Soldier; John Kennedy Toole (1937–1969), founder/publisher of The English Review, author of A Confederacy of Dunces; and abolitionist and poet John Greenleaf Whittier (1807–1892). It’s the first flight date of the Douglas DC-3 plane (1935) whose size and range helped establish the airline industry, and of the Boeing B-47 Stratojet (1947), which led to modern jet design for airliners. It’s National Maple Syrup Day. Read Sugaring Time by Kathryn Lasky, illustrated by Christopher G. Knight. December 17 was declared Wright Brothers Day in 1963 by Presidential Proclamation. Certainly these two Buckeyes, who lived their lives in Dayton, Ohio, have inspired numerous books for children. 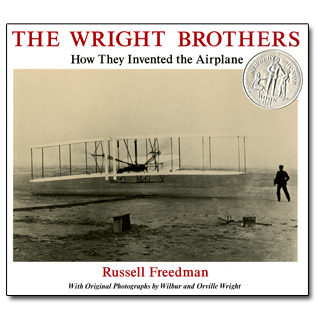 But the best remains Russell Freedman’s The Wright Brothers: How They Invented the Airplane, a Newbery Honor book published two decades ago. Freedman then goes on to present the Wrights, their family, their lack of education—neither graduated from high school—and their dreams. Like Icarus from Greek mythology, the boys wanted to fly. Many others pursued the same dream at the same time—people with money and recognition. True American icons, the Wright Brothers had neither backing nor credentials, but they possessed true grit. Freedman brilliantly takes readers through the failed attempts of the brothers in North Carolina’s Kill Devil Hills, and shows what they learned at each step. They are always guided by common sense and their ability to observe the natural world. Watching buzzards glide, they made suppositions about balance and control of wings. They proceeded cautiously, step by step. Wilber once wrote to his father “I do not intend to take dangerous chances, both because I have no wish to get hurt and because a fall would stop my experimenting.” Then each year they headed back to Dayton where they designed wind tunnels or changed their model. Finally, on December 17, 1903, at 10:35 a.m., the Wright Flyer achieved the world’s first successful powered and controlled airplane flight—lasting all of twelve seconds. 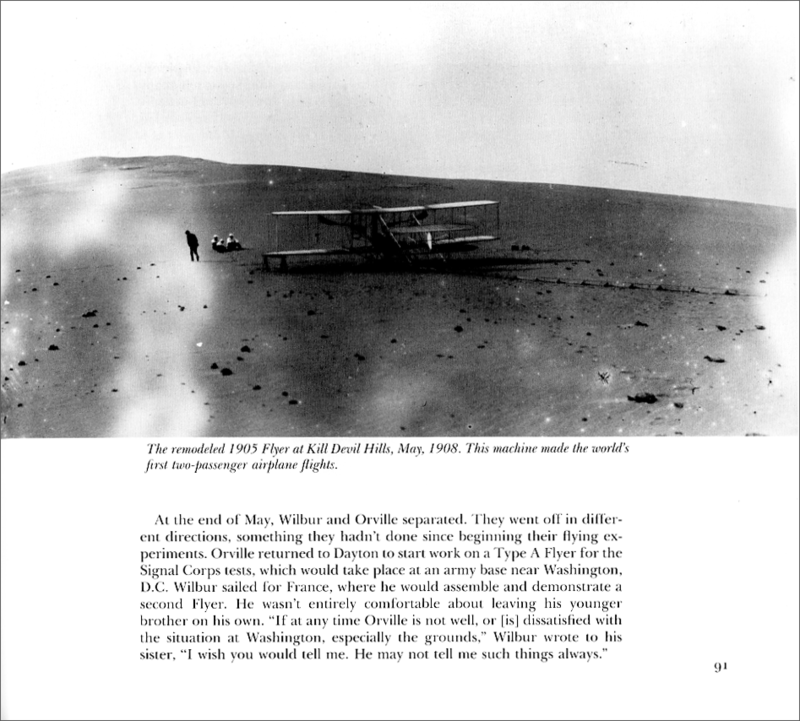 Most of this book focuses on the Wrights’ attempts to fly and then promote flight around the world. Because they knew the importance of their goal, they recorded it in photography and left three hundred glass-plate negatives. Freedman has lavishly illustrated this book with their own visual record. Hence it allows young readers to go back to the early 1900s, to watch and dream and spend time with Wilber and Orville. Give it to all the budding inventors in your life—and show them how two amateurs triumphed. Also recommended: Other biographies by Russell Freedman. Originally posted December 17, 2010. Updated for . Well, I’m was a pilot and i’ve not read this one, but I’m about to. I loved Freedman’s other books.